Nearly two years after voting to leave the EU, and in the midst of the turmoil of negotiating a possible deal, there is still very little consensus about Brexit in the UK. For young and old alike, there remains a lot of uncertainty, and as many opinions on the topic as there are people to express them. For young people – among whom an estimated 73% of 18–24 year olds voted against Brexit in the referendum – the as-yet-unclear consequences will stretch into the foreseeable future and beyond. So how do they feel about it? It is difficult to talk of young people as one homogeneous group, but with the help of some polling statistics, hopefully a clear enough sketch of general opinion will emerge. There were no exit polls at the Referendum, so voting statistics by age are estimates based on other surveys. On this basis it would seem that while over 70% of people aged 18-24 voted Remain, some 60% of those over 65 voted Leave. According to surveys carried out this summer, this polarisation has only increased, with 82% of 18–24 year olds saying they would vote to remain if a second referendum were held. Of course, the amount of knowledge about, and interest in, Brexit that young people have varies widely. Whilst some have become much more politically engaged as a result of it, others remain baffled by its complexity, as evidenced by a contestant on the well-known reality TV show “Love Island” this summer, who infamously asked if Brexit would mean there would be no more trees. Nevertheless, it would be unfair to accuse the younger generation of political ignorance or apathy when many older adults know no more about Brexit and its ramifications. In fact, it often seems that government ministers themselves are similarly confused. To go by the statistics above, one in four young people voted for Brexit, and for many of them, the issue of immigration was central. A lot of young people feel that immigration damages their job prospects and access to essential services such as education and healthcare. Thus by bringing an end to the free movement of people (one of the four non-negotiable freedoms of the EU), they feel that immigrants will no longer have privileges that should be offered first and foremost to British citizens. Another common view is that the EU meddles in British politics and that the UK would be better off being able to decide things for itself. 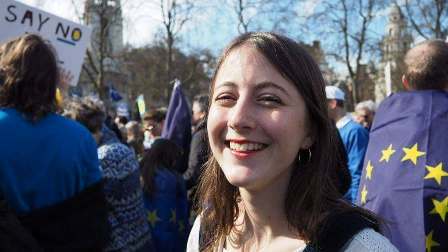 Alice (20), a medical student in the Midlands, says she “voted to leave the EU on the basis that I believe the EU is not democratic in the way we are represented and have to abide by the laws passed.” The ability to govern the country without outside regulations is not something that solely appeals to the older generation, but also to a (perhaps more conservative) portion of the younger generation. Furthermore, some people feel that the EU is trying to punish Britain by being uncompromising in negotiations. The motive for this is allegedly both to force the UK into continuing financial contributions and as a deterrent to other countries where Euroscepticism has taken hold. The so-called “divorce bill”, a financial settlement of approximately £39 billion, has reinforced this impression amongst many British people, to whom such a large sum seems absurd. This has therefore strengthened the position of those who argue for as quick a Brexit as possible, even if that means a “hard Brexit”. What about Brexit is so scary for young people? Even for the not-negligible proportion of young people who voted for Brexit, the uncertainty of it all remains troubling. For many who voted Leave and now are unsure what the future holds, as well as for the young people who voted against Brexit, fears abound – not least about what impact there will be on the job market. Many large firms, including banks, airlines and retailers, have already discussed moving their head offices to Europe, meaning a huge loss of both current and future jobs. At a time when the gig economy is expanding and young people face more and more job insecurity, this will most likely be very damaging. The British economy as a whole has gone from one of the fastest growing within the G7 to one of the slowest, and the pound has significantly lost value against both the Euro and the Dollar. Leaving the customs union (as the government promises) will undoubtedly have yet more economic ramifications, but what these will be is debatable. Some maintain that business and trade will carry on as usual the very next day. Others are more fearful – a few people have begun stockpiling food in case of shortages, and major supermarkets are already making plans for what to do in case of imports being severely limited. Even the army has drawn up plans to deliver food, medicines and fuel if necessary. In 2017, the UK imported 30% of all its food from the EU. Food and fuel prices have already increased since the referendum, and this hits those with less financial security hardest – young people, who may have young families to feed and are often on lower salaries than their older counterparts, included. Free movement will come to an end after Brexit, but the practicalities are murky – it is still unclear whether a visa will be needed for UK citizens to travel to or live in the EU, and vice versa. This will impact a lot of young people who have until now grown up being able to profit from cheap flights in and out of the Continent, and the possibility to both study and work abroad, not least through the ERASMUS+ scheme. All travel will most likely be made much more difficult and potentially more expensive after Brexit, thereby discouraging the younger generation from experiencing the excitement and challenges of living in or visiting other countries. This could well lead to a generation of British citizens who, by necessity, are more closed off from an ever more international world, which will not only deprive them of formative experiences and international friendships, but also hamper their chances on the job market. A further, less tangible but no less real, fear is that Brexit has made the UK more intolerant, and that the general atmosphere has become markedly more racist since the referendum, with those who oppose immigration feeling that their voice is more legitimate than ever. Reported hate crime has been on the rise since the referendum, including an increase in Islamophobic and anti-Semitic attacks. For a lot of more liberal or left-leaning young people, who in general tend to be more open and inclusive towards migrants than the older generation, this gives rise to the fear that the UK will become a place of intolerance, shut off from the positive benefits of multiculturalism which are already evident in many of the UK’s cities. Other key concerns of young people include security measures and environmental standards. The EU currently shares security intelligence through the Schengen Information System, in which the UK takes part, and without this shared database and collaboration, it will be harder for the UK to protect itself from security threats. Many ecologically-conscious young people also want the strict environmental regulations of the EU, including both climate change measures and agricultural standards, to be maintained in British law and not to be damaged by trade agreements with countries with generally more lax policies, such as the USA. A second chance for Remainers? Due to the considerable apprehension surrounding Brexit, vocal Remainers – thousands of young people included – have got involved in campaigns and political action. Around 100,000 people joined a protest to demand a second referendum on the second anniversary of the referendum in London this summer. Erin Bradshaw (20), currently studying European languages, took part (pictured above). “For me, the European Union represents the possibility of a world where the important issues which concern every one of us, such as human rights and climate change, can be addressed together. [Brexit] is a step backwards, away from a world of global solutions,” she said. The majority of people who voted to remain feel similarly pessimistic about Britain’s future ability to shape global issues. More recently, in mid-October, another protest of around 700,000 people marched through London, also demanding a second referendum. London Mayor Sadiq Khan and many MPs from all major parties took part, alongside people of all ages from all over the country, including many young families and people who were too young to vote at the time of the referendum in 2016. They feel that they should get a say in the Brexit debate, as it is their futures that will be affected. The protest in October was organised by the People’s Vote Campaign, which argues for a second referendum. The Liberal Democrats are currently the only political party to have expressed support for this, although many young people feel strongly that the people should get another say. Thomas Tozer (25), a graduate researcher in philosophy and politics, is one of them: “Now that the electorate is much more informed about what Brexit actually entails we should be given a second vote.” This is the most commonly-given justification for a second referendum. The idea of a second referendum has gained a lot of traction – a petition which ran from shortly before the referendum until November garnered over 4 million signatures in 6 months. However, many argue that a second referendum would be undemocratic as it would undermine the will of the people as expressed in the first one. Furthermore, the ballot paper itself would necessitate a lot of political debate, because it is unclear what questions should be posed. There are four potential options, each with their backers and detractors – leave with a deal that the government has negotiated, leave without accepting the terms of a negotiated deal, renegotiate a different deal, or remain in the EU and scrap Brexit entirely. It remains to be seen whether the government will address the protesters’ appeal. There is no doubt that Brexit has eaten up a hefty proportion of government time and resources, and as such has diverted attention away from other pressing issues such as education and prison reform, foreign policy, housing, the introduction of universal credit, and the NHS, amongst others. This has meant that other issues which, crucially, affect the day-to-day lives of thousands of young British people, have not had the political attention they deserve. Everyone – young and old, for and against, businesses and individuals – would appreciate more certainty about Brexit and the terms of a future trade deal, but not at the cost of all other political progress. This risks further undermining the already weak faith in the political process. There is no way of knowing exactly what the consequences of Brexit will be – the chances are they’ll be somewhere in between the best possible outcome peddled by Brexiteers, and the worst case scenario feared by Remainers. Hopefully, whichever way they voted, Brexit will remind members of the younger generation of the importance of political participation, rather than leaving them even more disillusioned with, and adrift from, political decision-making.